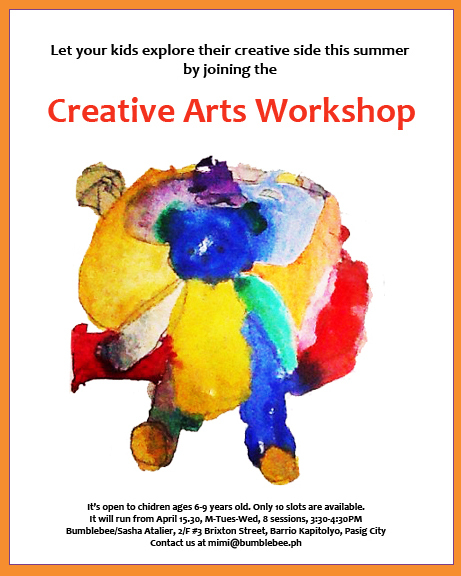 Friends, I will be conducting an art workshop for kids (ages 6-9) at the Bumblebee/Sasha Atalier, #3 Brixton Street, Barrio Kapitolyo, Pasig City, Philippines from April 15-30 (Mon/Tues/Wed), from 3:30-4:30PM, 8 sessions total. For enrollments and info, please send a message to mimi@bumblebee.ph 🙂 Only 10 slots are available! how much for the 8 sessions? is there still an available slot? Hi Badet! Yes, you can still sign up. You can download the form here. Scroll down and look for the Workshop info in the NEWS section. The price is indicated in the form. Thanks! Hope to see you soon!